Interactive Intelligence has launched its latest cloud services for enterprise collaboration and communications: PureCloud Collaborate℠ and PureCloud Communicate℠. 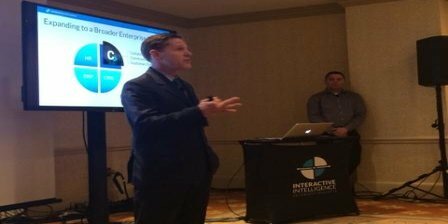 Interactive Intelligence Chief Marketing Officer Jeff Platon announces the company’s new enterprise collaboration and communications cloud services at Enterprise Connect 2015 in Orlando, Florida. These latest services are delivered from the company’s new multitenant, enterprise-grade PureCloud℠ platform designed for rapid deployment, unlimited scalability, and maximum reliability and security. Real-time enterprise collaboration tools, such as searchable employee profile information, instant messaging, multi-user chat rooms, multi-party video conferencing, and desktop sharing help increase productivity. Sophisticated IP PBX capabilities, including auto-attendant, call recording, speech recognition and unified messaging meet the needs of the largest organisations. Support for multiple voice, video and mobile endpoints extends communications and collaboration to any device, including landlines, for a more productive mobile workforce. Remote survivability provides PBX, IVR, and call recording functionality in the event of lost Internet connectivity for business continuity. With unlimited scalability and the ability to handle bursts of activity, PureCloud Collaborate℠ and Communicate℠ are ideal for the largest organizations, especially businesses that are highly cyclical. PureCloud Collaborate℠ and Communicate℠ are also ideal for SMBs that want a cost-effective “pay for what you use” subscription model. The PureCloud Collaborate℠ and Communicate℠ services will be offered by the Interactive Intelligence global channel of 350-plus resellers, and by the company’s direct salesforce. PureCloud Collaborate℠ is currently generally available as an unlimited free service to an unlimited number of users. PureCloud Communicate℠ is expected to be generally available in Q2. PureCloud Communicate℠ will include all PureCloud Collaborate℠ functionality, and add sophisticated telephony features such as IP PBX, fax, audio conferencing, remote survivability and advanced phone features. Pricing has not yet been released. Be the first to comment on "Interactive Intelligence Launch PureCloud"